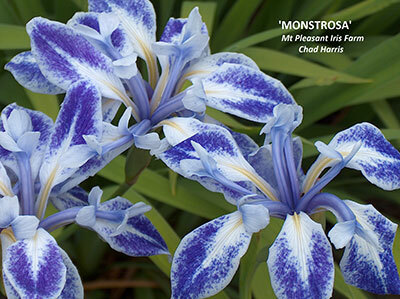 Iris laevigata is a species iris found from Lake Baikal, Siberia to temperate eastern Asia and Japan. The average winter temperatures at Lake Baikal are -25C and the average winter temperatures for Kyoto, Japan is 0C; while the summer average temperatures for said are 17C and 30C. Iris laevigata is said to be the most water demanding of the "water-loving" irises in its series, which includes Iris ensata (Asia), Iris pseudacorus (Europe), Iris versicolor, and Iris virginica (eastern United States), being able to grow with its crown completely below the waterline year round. However, I am finding at Mt. 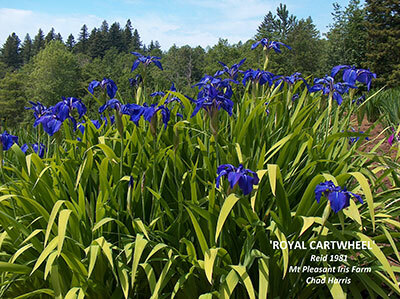 Pleasant Iris that Iris laevigata will thrive in an ordinary garden setting, such as a rain garden that is rich with moisture retentive compost and a weekly watering of 6-11cm, and does not have to be grown in standing water. The growth of the rhizome is strongly horizontal like Iris pseudacorus, seeking out new soils each year in which to set new feeder roots, unlike another close cousin, Iris ensata, whose rhizome has a more vertical growth habit. The slightly acid soil (5.8 to 6.8) should be rich in composted organic material, thus helping with the retention of moisture and also the feeding of the plant. Except for the natural ponds, the plants at Mt. 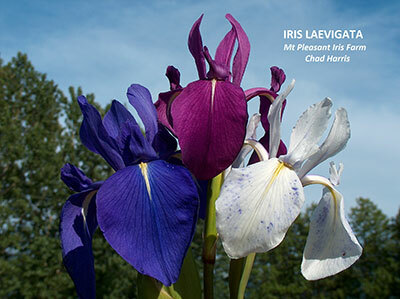 Pleasant Iris are lifted, divided, and transplanted to organically-enriched soils every three years. I do believe that they would also like a side dressing of chemical fertiliser; however, we have not found it necessary with our soil. The container-grown plants, on the other hand, do get an annual feeding of a slow release balanced food. If you do not have the correct garden space, Iris laevigata can easily be grown in a container with only a few thoughts to keep in mind. Most books and websites state that it can be grown in a one gallon size container. However, the complete root and rhizome structure of this plant is large and will outgrow this size of container in less than a year, so I recommend that a two to three gallon container be used – you will still need to repot every year ao two for good strong growth and bloom. Transplanting should be done a few weeks after bloom, cutting out and discarding the old rhizome (keeping the new side increases), root mat, and refreshing the soil with new. A peat based non-soil mix for containers found at many lager nurseries is an ideal blend and is what we use for the patio plantings. Watering is done as needed to keep the soil moist. A large tray of water under the container can be used for extended waterings. I have the plants next to my bonsai collection so as to be able to water every day, sometimes twice, if that is needed. One important tip that all container growers should know is to double-pot your plants for insulation from the sun’s radiant heat, also for decorative purposes. If you do so, you will be surprised at how warm the outside ceramic container will be to the touch and how cool the inside poly-container with the roots inside is. I have grown Iris laevigata in both non-drained containers and with drainage holes, preferring the later. With drainage Iris Laevigata sasemeyuki chad harris Mtpleasantirisholes at the bottom of each container, you may leave them out during the winter with less threat of the ceramic container being broken by a freeze, as it is the soil a water expanding in the ceramic container that does the real damage by breaking it. Iris laevigata is very handsome in and out of bloom with unique lime-green coloured foliage that can be 61-91cm in height. Of course, as with many other plants, there is also a variegated form, white and green, that is striking however slightly less vigorous. The blooms come in only three colours: white (alba), blue-violet, red-violet, and all shades of which are dark to pastel. Flower forms are simple including three fall flowers and some six fall flowers. The patterns besides the self’s are mostly freckled or mottled with large patches or splotches of colour. I have also found few that have faint veining on the falls and have introduced one, Laevigata Blue Rivulets Chad Harris mtpleasantiris'Blue Rivulets’, that has very bright , dark veining. The past few years, I have observed that the red-violet blooming plants are slightly smaller in stature and height than the blue-violet or white blooming plants and would very much like to hear from others on this observation. In the last field of seedlings, there was a marked difference in the blooming times, almost a full two weeks, from one cross to another. 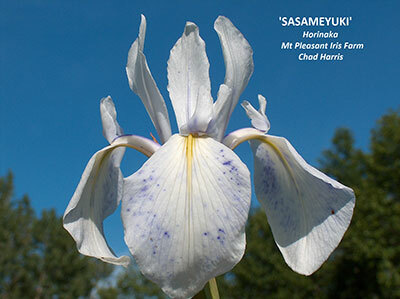 Iris laevigata (known as Kakitsubata in Japan) has been long admired both in writings (poems) and in the garden. It is a tough and easy iris to grow with a lot of future potential in bloom size, petal count, colour/pattern variation, and blooming season. Come, join me, grow a few plants and seedlings and let us unlock the doors and explore the full potential of this wonderful iris.